For the third time this year, legislation I authored is headed to the governor for his approval. On Wednesday, the Senate approved House Bill 44 without amendment. It would require courts to have complete records regarding whether a child subject to a Protection from Abuse (PFA) proceeding has been abused or is the subject of a child abuse investigation. More specifically, the bill would require a plaintiff in a PFA case to notify the courts if he or she has knowledge of a substantiated child abuse investigation so that the courts will know that a PFA order issued may have a legal impact on the defendant in the realm of child abuse. The petition also would set forth the name of the investigative agency. The bill is the result of recommendations made by the Task Force on Child Protection in 2012. A $192,000 Community Conservation Partnership Program (C2P2) grant was awarded to Lower Allen Township for rehabilitation of its community park. Work will include restoration of the 24-year-old Fun Fort that was partially damaged by arson. A portion of it was fixed in 2012. This grant will allow for replacement of the remaining wooden elements with a new structure made of wood composite material. In addition, a seven-foot high bridge, climbing wall, zipline, slides and swings will be added. Furthermore, rubber surfacing will be installed for better accessibility, and more benches, trees and fencing will be included. The renovation is the result of public input. • On Tuesday, I accepted a certificate from Americans for Prosperity (AFP) for my voting record on issues such as budgets and spending, corporate welfare, criminal justice reform and labor. 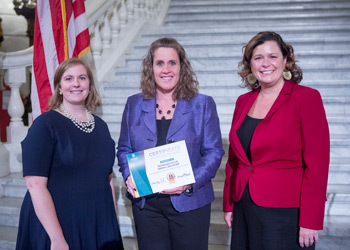 Pictured with me (from left) are AFP-PA Deputy State Director Anna McCauslin and State Director Beth Anne Mumford. • Last week, I spoke to seventh-grade students at Harrisburg Academy in preparation for them creating a short video on the topic of what it means to be an American. I always enjoy addressing the students annually in advance of their video project. • Just over a dozen gifted students from Crossroads Middle School visited the Capitol this week. It was an honor to introduce them on the House floor. • My office participated in the Cumberland County 50+ Senior Expo at the Carlisle Expo Center. The annual event offers free health screenings, seminars and entertainment. I was happy to offer information about state-related services. • Domestic Violence Services of Cumberland and Perry counties held its annual Candlelight Vigil to honor and remember victims of domestic violence. The evening featured guest speakers and the Silent Witness exhibit. • Thirteen residents of Messiah Village were recognized for turning at least 100 year of age this year. I was proud to present House citations to them recognizing this accomplishment. • Last weekend, I was glad to be at Vickie’s Angel Walk in New Cumberland. This organization has been providing a financial bridge for families fighting cancer for 15 years.